Now that is a bold title – Five Words That Explain it All. What does that even mean? How can five words explain everything about everything? Well they can’t, but if we use the five words as tools to live by then those five words can explain our actions in every situation. Well, what are the words? In the Liechtenauer school of fencing specifically in the Dobringer Cod.HS.3227a codex Hanko Dobringer writes this, “Before [Vor], After[Nach], Weak [Weich], Strong [Hart], in that instant/just as [Indes]. 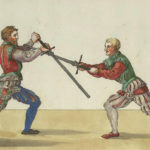 On these words hinge the whole art of Liechtenauer, and they are the foundation and cornerstone of all fencing on foot or on horseback, in armour [Harnusche] or without [Blos].” So the words are Before, After, Weak, Strong, and In the instant/moment. In the art of the sword these words have a very powerful meaning. Let’s take a moment and explore that before we go on. Before. If you attack before your opponent then you are usually much safer than waiting for them to attack. If fact, if you succeed in your attack; then your opponent does not even have the opportunity to respond to it. After. If you cannot attack in the before then attack in the after. Make sure that you take initiative away from your opponent. Take control of the fight. Weak. Liechtenauer states that if your opponent is strong, then be weak. This does not mean to concede, but rather to use your opponent’s strength against him. Fall back, re-group, and find another way. Strong. The other side to that statement is when your opponent is weak, be strong. If the opponent is drawing away press him. Don’t allow him to re-group. In the instant/moment. Always be aware of what is happening now. What is your opponent doing? Where are you spatially in regards to each other? Where is his sword? Be aware of your physical surroundings (trees, rocks, mud, etc.). These are all very important concepts in sword. In fact these are the basic concepts to almost all martial arts distilled down to five words. These base concepts span all of martial arts history and are as true today as they were in the 1300s. Okay, that’s great. If I get in a fight I know to use these as the basis of my strategic and tactical thinking, but how do these words have any relation to my life in general? Well, let’s look at this in light of our everyday life and then we will get into how we can use these words as the basis of our faith walk. In our everyday secular life we wake up, go to do what we do during the day, come home, and go to bed in order to start the whole process again tomorrow. But the five words are always there. Before. I have to be first. I must cut in in front of that other car. I need to get that last bagel before someone else does. After. I better get that project done before my boss finds out that it’s late. The Jones’ just got that new car, I better get one too. Weak. Hello officer, what seems to be the problem? Strong. I need that report now. In that instant/moment. Honey I love you. Why is that guy riding my tail? Not necessarily the most flattering examples, but you can see that these words are definitely applicable in everyday life. So how about our faith walk? As we go through our day could these words help us avoid the trips and traps of sin? Can they be used to help us get closer to God and to follow his teachings? Let’s find out. Before. Pray. Pray before everything. Luke 9:16 “Then He took the five loaves and the two fish, and looking up to heaven, He blessed them, and broke them, and kept giving them to the disciples to set before the people.” Before Jesus gave the loaves and fishes he blessed them. He prayed. Matthew 26:36 “Then Jesus came with them to a place called Gethsemane, and he said to his disciples, ‘Sit here while I go over there and pray.’” Jesus prayed before he did anything. That is an example that we need to emulate. After. Be thankful and try to sin no more. As Catholics we have the sacrament of Reconciliation that we can take advantage of. We can go and have our sins forgiven so we can take back the initiative of our faith. Jesus said this multiple times. John 5:14 “Afterward Jesus findeth him in the temple, and said unto him, Behold, thou art made whole: sin no more, lest a worse thing befall thee.” John 8:11 “She said, ‘No one, Lord.’ And Jesus said, ‘I do not condemn you, either. Go. From now on sin no more.’” Jesus teaches us to “Go” this is not passive. This is something that we should be actively seeking, to sin no more. In that instant/moment. Of all of the words this is the one that I believe is the hardest. In that moment of temptation, that moment of sin we must stand firm and be aware of what is happening. We have to make a choice. In sword it is the choice of what next. Do I block? Do I attack? In our faith it is the choice of, do I trust? It is hard to be in the moment. Matthew 4: 3-4 “The tempter came and said to him, “If you are the Son of God, command these stones to become loaves of bread.” 4 But he answered, “It is written, ‘One does not live by bread alone, but by every word that comes from the mouth of God.’” Jesus was in the moment. He recognized the trap of sin for what it was and refused to succumb. We look at when Jesus called the Disciples. He walked up to a couple of people and said “Hey you drop what you are doing and follow.” And they did. Should we do any less? In each moment of our day what can we do to glorify God? So, five words that explain it all? Maybe, maybe not; however, the concepts behind them can be used to help us be better Christians and people. The art of the sword, like so many other things in life takes dedication, and practice. You don’t pick it up and are immediately good. The same is truth of the faith. We need tools that we can use to practice on a daily basis the lessons we learn from the bible. These words give us a tool to remember who we are and what we are striving for. Just like the Fechtbuchs of old they give us a representation that will call to mind the technique to use for victory.